The knee is a hinge joint formed by three main bones: the femur (thighbone), tibia (shinbone) and the patella (kneecap). The knee is held together by four bands of connective tissue that prevent the knee from moving about. These are the four major ligaments of the knee, namely the Medial Collateral Ligament (MCL), Lateral Collateral Ligament (LCL), Anterior Cruciate Ligament (ACL), and the Posterior Cruciate Ligament (PCL). The ACL runs diagonally in the middle of the knee, preventing the tibia from sliding out in front of the femur, as well as providing rotational stability to the knee. The MCL limits the lateral movement of the knee joint, and is most commonly injured from force that hits the outer side of the knee. The LCL runs between the femur and the fibula on the outer side of the knee. The LCL also stabilizes the knee against lateral movement. It is most commonly injured from force that hits the inner side of the knee. Similar to the ACL, the PCL controls the backwards and forward movements of the knee. How does ACL injury occur? In the United States of America alone, there are over 200,000 estimated ACL injuries, making the ACL one of the most commonly injured ligaments of the knee. Greater risk for ACL injury exists among athletes that play sports that significantly stress the knee joint, particularly from rapid movement and sudden impact, such as basketball, skiing, soccer, and football. It has been estimated that 70 percent of ACL injuries are from non-contact mechanisms (such as falls, or landing awkwardly), although direct trauma to the knee has been known to cause ACL injury. How is ACL reconstruction done? 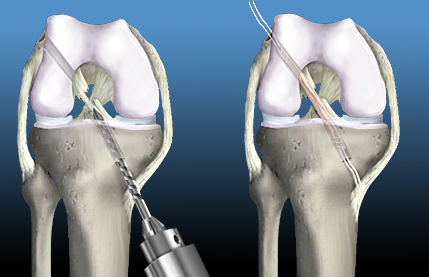 Contrary to its name, reconstruction of the ACL is not done, since a torn ACL cannot be sewn back together. The procedure refers to the surgical graft replacement of the torn ligament with a tendon that is harvested either from the patient’s own body or from a cadaver. eat surgery. The most commonly used grafts are autografts using the patellar tendon, or one of the hamstring tendons. What are the advantages of ACL reconstruction? 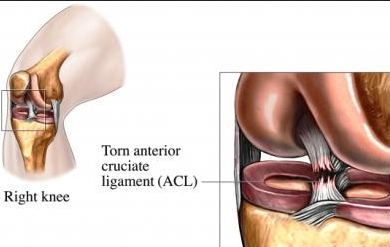 ACL reconstruction provides definitive treatment of tears and injury to the ACL, and may be the best treatment option, particularly for complete tears of the ACL. The gold standard for the treatment of ACL is still reconstruction with patellar tendon autografts. Recovery from the surgery can take up to a year, and requires the patient to join a program of physical therapy and rehabilitation to return to normal function. What are the disadvantages of ACL reconstruction? There is a small risk of persistent postoperative pain, and the presence of postoperative stiffness, despite the surgery. Graft failure can occur with both autografts and allografts, and there are the general risks of surgery, such as infection, intraoperative damage to the surrounding muscles and tissues, as well as bleeding and hematoma formation. However, these risks are typically manageable and ACL reconstruction is known to be a well-tolerated procedure with acceptable complication rates.